Why Did Attempts to Isolate Iran Fail? This year, the Valdai Discussion Club took part in the 2018 Doha Forum for the first time by holding a session titled “Russia’s evolving global role” on December 16 as part of the event’s business program. Director of PIR Center’s “Russia and nuclear non-proliferation” program Andrei Baklitsky was at the forum and shared his comments with valdaiclub.com on the speech by Iranian Foreign Minister Javad Zarif, whom he views as one of the best diplomats in today’s world. At first glance, the December 16 speech by Iran’s Foreign Minister Javad Zarif could hardly be regarded as anything exceptional. Despite all the attempts by the moderator to pin down the speaker, being one of the world’s best diplomats, Zarif answered the questions that suited him, and confidently evaded those that did not present Teheran in a favorable light. The planes shelling Yemen were not Iranian, but American; Iran operates in Syria at the request of its legitimate government; and Washington does not abide by the Joint Comprehensive Plan of Action (JCPOA), while Iran continues to honor its commitments; and the US with its domestic challenges better refrain from lecturing Iran on human rights. It seems that although the relations between Iran and the US have undoubtedly worsened since the beginning of Trump’s presidency, at the current situation, neither Washington nor Tehran wants to enter an open confrontation. Rather than his remarks per se, what stood out was the geography. 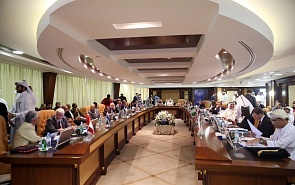 The Iranian minister was speaking at the Doha Forum, an annual conference hosted by Qatar, an Arab Sunni state, and member of the Gulf Cooperation Council (GCC). Zarif was on the same peninsula with Saudi Arabia and the UAE, Iran’s main geopolitical opponents. This provided quite an interesting glimpse into the Arab world, since the audience applauded not only Zarif’s typically whimsical answers, but also his remarks on the blockade of Qatar and accusations of Riyadh’s involvement in the killing of Jamal Khashoggi. Just a few years ago few could image this. Even last year, when Saudi Arabia put in placed the blockade, there was not a single Iranian official on the speakers’ list. Quite understandably, Doha is sparing no effort to show that all the attempts to isolate it have failed. Representatives of 70 countries attended the conference, including the UN secretary-general, his under-secretaries, including Vladimir Voronkov, president of the UN General Assembly, as well as foreign ministers from European, African, Asian and Latin American countries. Valdai Discussion Club held a special session devoted to Russia. Targeted Involvement: Will Russia Keep the Ability for Dialogue with all Players in the Middle East? A decade ago, it was difficult to imagine a heated discussion on the growing role of Russia in the Middle East and in the world as a whole. However, today Russia successfully combines many roles: from that of a peacemaker to that of a power center, which many are interested in, and all the players are ready to talk to. It is more than likely that Zarif was also pleased by this opportunity. Not only was he offered a convenient venue for setting out Iran’s position on regional and global affairs, but also a possibility to hold bilateral meetings with Qatar’s foreign minister and prime minister. Saudi Arabia’s open hostility forced Doha to review its foreign policy priorities. While Alitalia alongside other European carriers cancel service to Tehran, Qatar Airways has increased the number of flights to Iran and opened a direct air bridge to Isfahan. The two countries doubled bilateral trade (excluding oil) compared to the previous year. Following the US withdrawal from the JCPOA, the Iranian government, it must be acknowledged, has played a bad hand quite well. While Riyadh is seeking to restore its reputation in the wake of Jamal Khashoggi’s killing and the humanitarian disaster in Yemen, Tehran is positioning itself as a responsible country, and makes no secret of its positive role in launching the negotiating process in Yemen. However, diplomacy cannot solve everything. In Qatar’s case, the air space above the UAE and Saudi Arabia remains closed for civilian aircraft heading to Doha, which means that being able to use Iranian air space is vital for the emirate. This explains Qatar’s willingness to reciprocate and stand up for its decisions in its relations with the US. The situation may change once the blockade is lifted. This is not an isolated occurrence. According to media reports, China National Petroleum Corporation (CNPC) has halted investment in the development of the South Pars gas project in Iran. Reuters believes that the Chinese state company wants to avoid any actions that could have a negative effect on the ongoing trade talks with the US. Tehran has no control over what happens in relations between Washington and Beijing, Washington and Brussels or Doha and Riyadh, though it plays a major role in Iran’s economic and political planning. The country has found itself in a tight spot. Despite the sympathy demonstrated by the international community and official statements by a majority of the world’s governments, at the end of the day Tehran is left to its own devices, and Javad Zarif surely understands this. However, the Iranian Foreign Ministry will continue to bolster the country’s image internationally, while keeping a close eye on the cards it is dealt. After all, with all the odds stacked against it, Iran still has a chance to pull an ace, and would be foolish not to take advantage of it. Tehran has no control over what happens in relations between Washington and Beijing, Washington and Brussels or Doha and Riyadh, though it plays a major role in Iran’s economic and political planning.